Pyelonephritis is an infection of the uppermost section of the urinary tract. 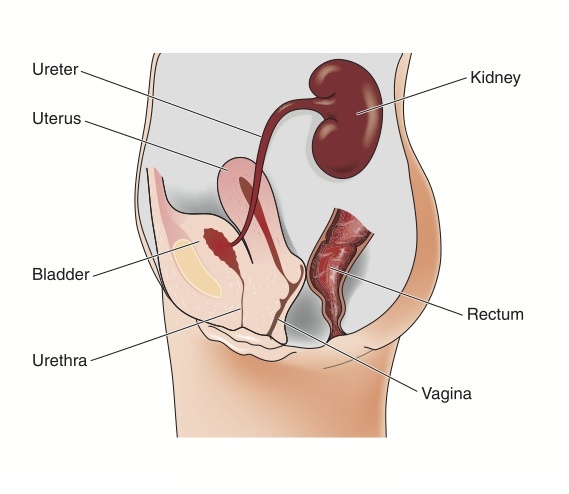 The condition is more common in women with asymptomatic urinary tract or bladder infection. Studies have identified a risk ratio of 14 to 1,000. This means about 14 cases of acute pyelonephritis are diagnosed per 1,000 pregnancies. It is estimated that up to 70-percent of cases can be avoided with regular urine cultures and subsequent treatment for bacterium present in urine. Treatment for urinary infections, including bladder infections and pyelonephritis, is a course of antibiotics. Pyelonephritis occurs more frequently in pregnant patients due to increased progesterone and pressure placed on the ureters by the growing uterus. In about 85-percent of cases, E. coli is the bacterium responsible for infection though other bacterium, including staphylococcus and group D streptococci may also be responsible. Some pregnant women may show no symptoms of bacterial infection, including common bladder infection symptoms. Other women will present with fever, nausea and vomiting. Pain in the kidney area may also be present. In about 85-percent of cases, pain is felt on the right side. Untreated pyelonephritis may cause other pregnancy complications, including respiratory distress, anemia and impaired kidney function. About 20-percent of severe cases lead to septic shock with acute respiratory and kidney malfunction. About 5-percent of women with an acute form of the infection will suffer preterm delivery. Pregnant women with pyelonephritis are typically treated with intravenous (IV) antibiotics until fever dissipates for at least 48 hours. Fever is indicative of an active infection, but some doctors will require a negative urine culture before pregnant patients are discharged to complete antibiotic treatment at home. If the patient does not respond to IV antibiotic treatment within 48 hours, the antibiotic should be changed and another urine culture performed to rule out other possible infections. If the urine culture comes back positive for pyelonephritis-causing bacteria, the patient may have a persistent strain requiring additional IV antibiotic treatment. After discharge, oral antibiotics may be prescribed for up to 14 days to prevent recurrence. After being treated for pyelonephritis, pregnant patients should be tested with a urine culture at least once a month. If pyelonephritis recurs, patients may be placed on long-term oral antibiotics for the duration of the pregnancy to prevent infection. Pyelonephritis is a serious infection of the urinary tract that can only be treated with a strong course of antibiotics.